Ashe has well and truly arrived on Overwatch’s live servers, which means there’s a new round of experimental changes in the public test region. This time around the changes are mostly balancing adjustments that don’t do much to change the viability of the heroes concerned. However, everyone’s favourite shield maiden has received a fairly significant nerf that may have a big impact on the way her mains play her. 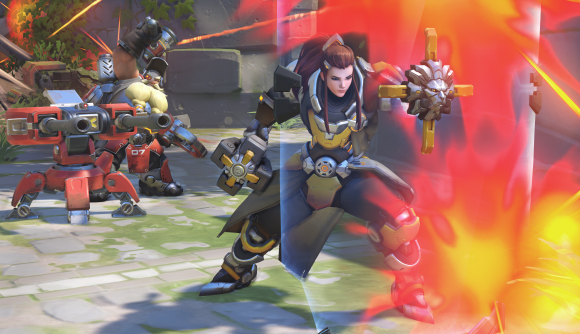 Brigitte’s Shield Bash was largely implemented as an effective counter against quick DPS heroes like Genji and Tracer but she soon became the ire of shield-based tanks, namely Reinhardt and Orisa, due to her ability to stun through shield – which in the case of Rein, cancels his shield entirely. The Shield Bash can no longer travel or stun targets through barriers, meaning that players will have to think a little more carefully about where they are placing their bashes. Brig isn’t the only one getting tweaks. First in line for a buff is Bastion, who’s Recon configuration ammo has been upped from 25 to 35. His spread in Sentry mode has also been reduced giving him greater accuracy at longer ranges. McCree’s alternate fire has been granted a buff, increasing from 45 damage to 55. This buff makes the gunslinger more potent at close-range, allowing him to more quickly cut down the health of tanks. Torbjörn’s rework has been generally well-received but his ultimate ability feels a little underpowered. The devs have remedied this by raising his Molten Core’s damage from 130 to 160 per second. Finally, Doomfist has had a couple of tweaks. His devastating Seismic Slam ability has had it’s range mercifully cut down from 20 meters to 15 meters, while his loss of air control using Rising Uppercut has been vastly reduced, from 3 seconds to 0.6 seconds. There is also a handful of treats for fans of cosmetics in the update. Those who have earned (or bought) any of the Overwatch League team skins will now be able to access the Away versions of the skins they own – that’s a free skin! Those who have purchased Ashe’s golden weapon will also get a bonus – a fully golden B.O.B., which we can all agree is sufficiently adorable. As with all PTR updates, none of these changes are set in stone and are subject to change based on the results of the ongoing tests. There are also a number of bug fixes, which you can read the details of here.